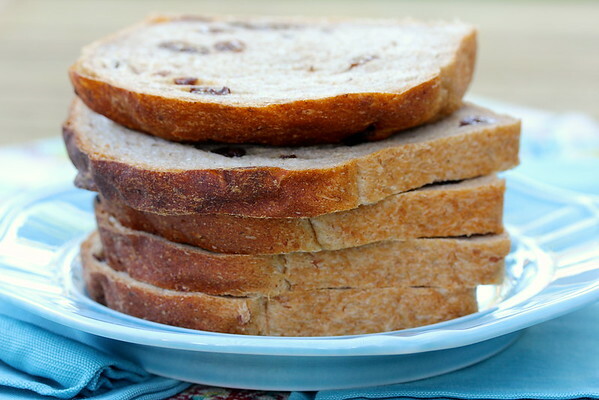 This cinnamon raisin oatmeal bread is super easy to make, and is the perfect bread for breakfast toast. It is also wonderful for French toast and peanut butter sandwiches. There's something about toasted raisin bread spread with melty salted butter for breakfast.... and it's full of whole grains... a little healthy with your butter. Note: This recipe makes a lot of dough, about 4 3/4 pounds, including the raisins. You can divide the dough into pan loaves, free standing loaves, or rolls. You can also spray the tops of the loaves with water and press rolled oats into the surface to make them extra pretty. Math whiz that I am (not), and with my collection of 6 sizes of bread pans (not counting baguette pans), I broke out a 1 pound pan (4 1/2 x 8 inch), a 1 1/2 pound pan (5 x 9 inch), and a 2 pound pan (5 x 10 inch), and, using my kitchen scale (get one! you totally won't regret it), divided the dough among all three. They kind of looked like loaves from Goldilocks and the Three Bears. We gave away two of the loaves, and kept Papa Bear's. The surface of this bread may burn easily in the hot oven, so keep an eye on your bread and tent the loaves with aluminum foil when they are sufficiently browned. There are few things more fun than watching bread bake through your oven window. Magical, at least for a bread geek like me. Do you like oats in your bread? 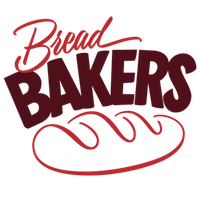 After the recipe, check out all of the #BreadBakers members' contributions this month. There are over two dozen different recipes for bread using oats! Add the oats to the bowl of a stand mixer. Add the water and mix to moisten for about a minute. Let stand for about 20 minutes. Add the rest of the ingredients except the raisins and mix with the dough hook on low for three minutes. Change the speed to to medium low and mix for about 4 minutes. Add the raisins and mix on the lowest speed for about a minute, until the raisins are mixed in. If necessary, knead by hand to get the raisins thoroughly distributed. Place the dough into a large oiled bowl, cover with plastic wrap, and let the dough rise for 2 hours, folding at the one hour mark. Divide the dough and shape as you wish, into loaves or rolls (see Note above). Preheat the oven to 450 degrees F and set a pan on the lowest rack for creating steam, and a rack in the middle for baking the bread. Place the bread pans on the middle rack and add 4 ice cubes and 1/2 cup of water to the steam pan. Quickly shut the oven door. After 15 minutes, lower the temperature to 425 degrees F and tent the bread if it is sufficiently browned. Depending on the size of your loaves, the bread should take an additional 30 to 45 minutes more. I use an instant read thermometer to test the loaves. The internal temperature should be about 190 to 200 degrees F.
We take turns hosting each month and choosing the theme/ingredient. This month's host is Rocio from Kids & Chic. Thanks for the wonderful theme! Here are the amazing breads! Oh yes, I definitely like oats in bread. Beautiful loaves you baked as usual. You inspire me each time. What a beautiful loaf! I love raisin bread. My favorite thing to make from it: Bread Pudding (with Whiskey Sauce, of course). Kudos on a perfect loaf! Is there ever a bad time for cinnamon raisin bread? I think this makes the absolutely best toast. Never a bad time Adam! Raisin bread is my favorite and my son would love this too. Adding it to the list of breads to bake asap! Perfect for the kiddos Holly! Right? You make the most beautiful breads!! Love this combo of a great pick me up bread.- cinnamon, raisin, oatmeal!! Now where is my coffee! Awww. Thanks Ansh! Bread is my zen. Cinnamon raisin anything is my favorite! This bread wold be amazing in french toast! I love cinnamon raisin bread. I can almost taste this it looks so good. I am so making this next week. My kids will be here and they'll love it. Yay! Sprinkle some cinnamon sugar on top too and they will go crazy! The quintessential cinnamon + raisin + oats. Always a great choice. Karen, that is such a beautiful bread!! I love how it looks and I wish I could taste some right now!! 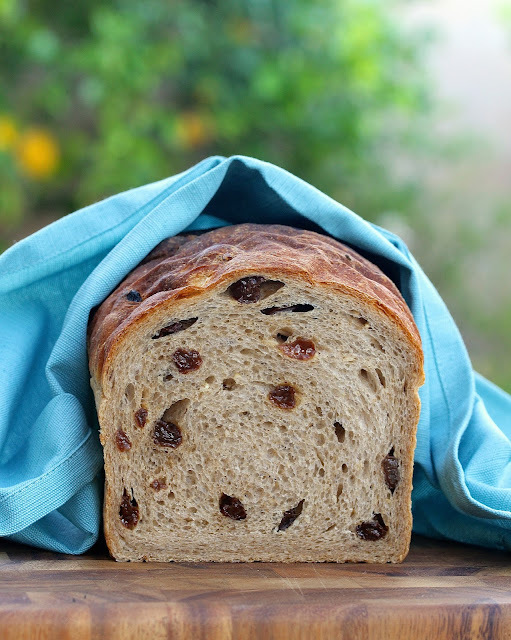 Beautifully baked bread and love the combo of raisin and cinnamon. Karen your bread is a perfect blend of choice for both my husband and me. His being raisin and mine cinnamon. I reckon my little one too would enjoy it. I will definitely give it a go once I settle down and heal completely. Wow, what a beautiful loaf Karen. I love cinnamon raisin bread and your version with wholewheat flour and oats sounds just awesome. Your loaf looks wonderful.. Sounds so healthy with whole wheat flour, oats and raisins..